88rising, the record label that’s primarily home to Asian hip hop acts, is throwing its own music festival, Head In The Clouds, on September 22 in Los Angeles State Historic Park. The lineup includes 88rising acts Rich Brian, Joji, Keith Ape, Higher Brothers, NIKI and August 08, as well as Zion T, Yung Bans, Yung Pinch, Kohh, Laff Traxx (aka Toro y Moi & Nosaj Thing), Diablo, Don Krez, and more TBA. Tickets go on sale Thursday (5/10) at 10 AM Pacific with a presale starting Tuesday (5/8) at 10 AM Pacific. 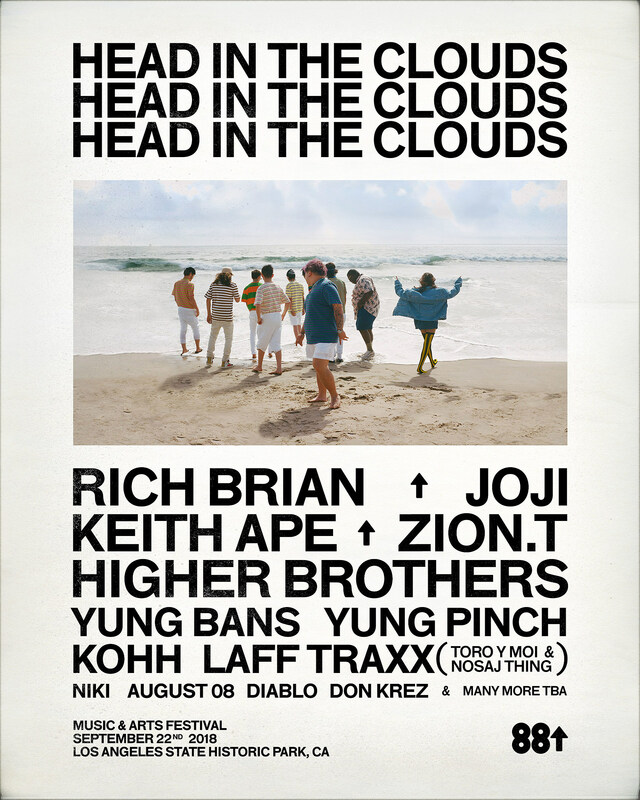 There’s also an 88rising crew album called Head In The Clouds expected this summer, which will feature music by Rich Brian, Joji, Higher Brothers, NIKI, AUGUST 08, and more. Watch an announcement video for the festival, below.